It seems like I read an article every week that reaffirms how vital email campaigns are to a company's marketing plan. There's also almost always a nod to the importance of social media marketing. Individually, email marketing and social networking are powerful tools that are sure to garner results for a company of any size. Integrating them, however, improves on the effectiveness of both. With that in mind, we've added a new feature to our email builder that lets you add clickable Facebook, Twitter and LinkedIn buttons to any section of your email newsletter. Your subscribers visually recognize the logos or icons, and clicking them brings them right to your Facebook, Twitter or LinkedIn page. Log in to your account and create or edit an email campaign as usual. Once you get to the Editor page, find the block where the link will go into. Click the Edit Block icon. On the left side of the screen, there is an Insert Additional Elements section. Click on the Facebook, LinkedIn, or Twitter icons next to Link to. A new window will appear. 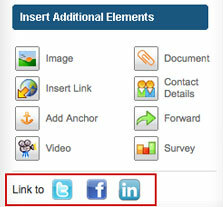 Choose a button, and fill in the URL for your Facebook, LinkedIn or Twitter page where it prompts you to Insert Link. Rinse and repeat (follow the same instructions to add the other buttons).